Kumar, V. et al. Distribution, Enrichment and Accumulation of Heavy Metals in Soil and Vigna Mungo L. Hepper (Black Gram) After Irrigation with Distillery Wastewater. (2014) J Environ Health Sci 1(1): 1-8. © 2014 Kumar, V. This is an Open access article distributed under the terms of Creative Commons Attribution 4.0 International License. The present investigation was aimed to study the distribution, enrichment and accumulation of heavy metals in soil and Vigna mungo (Black gram, var. Pant U-30) after irrigation with distillery wastewater. A field experiment was conducted in the experimental garden of Gurukula Kangri University, Haridwar during the year 2012 and 2013. Treatments of distillery wastewater viz. 20%, 40%, 60%, 80% and 100% was used for irrigation of V. mungo along with bore well water (control). The results revealed that distillery wastewater showed significant (P < 0.05/ P < 0.01) effect on the soil characteristics viz., EC, pH, Cl-, OC, Na+, K+, Ca2+, Mg2+, Fe2+, TKN, PO43-, SO42-, Cd, Cr, Cu, Mn and Zn of the soil. The soil characteristics were recorded to be positively correlated with different concentration of distillery wastewater. The agronomical characteristics viz., shoot length, root length, number of flowers, pods, dry weight, chlorophyll content, leaf area index (LAI), crop yield and harvest index (HI) of V. mungo were recorded maximum with 40% concentration of distillery wastewater. 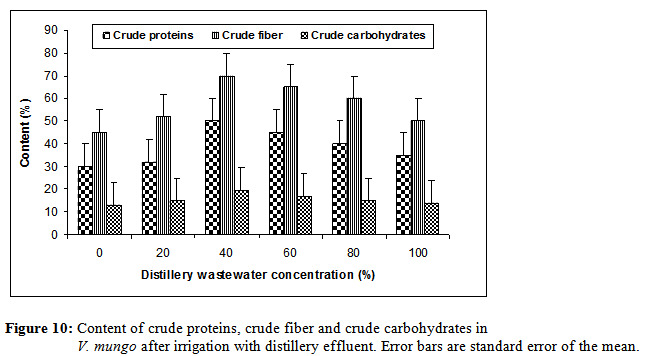 The biochemical components viz., crude proteins, crude fiber and crude carbohydrates were noted maximum with 40% concentration of distillery wastewater. The enrichment factor of heavy metals was in the order of Cd>Cr>Zn>Cu>Mn for soil and Cu>Mn>Zn>Cr>Cd for V. mungo after irrigation with distillery wastewater. The accumulation of various heavy metals in different parts of V. mungo were in order of leaves>shoot>root> fruits for Cu, Mn and Zn, root>shoot>leaves>fruit for Cd and Cr after distillery wastewater irrigation. Therefore, the distillery wastewater with appropriate dilution can be used as a bio-fertigant for the V. mungo. The disposal of wastewater is a major problem faced by distilleries due to generation of high volume of wastewater and with limited space for land based treatment and disposal[1-3]. On the other hand, wastewater is also a resource that can be applied for productive uses since wastewater contains nutrients that have the potential for cultivation of agricultural crops[4-6]. Irrigation with wastewaters is known to contribute significantly to the heavy metals content of soil as well as crop plants[7,8]. Excessive accumulation of heavy metals in agricultural soils through wastewater irrigation may not only result in soil contamination, but also affect food quality and safety[9-11]. India has nearly 330 distilleries producing about 3,500 million liter alcohol. They generate a huge amount of waste water (spent wash) with high chemical oxygen demand (COD) and biochemical oxygen demand (BOD)[13,14]. Black gram (Vigna mungo or Phaseolus mungo) is one of the most important pulse crops for human consumption in India and Middle East. It is used green or dried, fresh or canned, and for stock feed. The roasted seed of black gram are eaten like peanuts. It is rich in protein, vitamins, calcium, magnesium, sodium, potassium, iron and fibers. It is largely used to make dal from the whole or split, de husked seeds. The bean is boiled and eaten whole or, after splitting, made into dal prepared like this it has an unusual mucilaginous texture. It is also extensively used in South Indian culinary preparations such as idli-dosa batter, idli-rice, vada and paapad. The utilization of industrial waste as soil amendment and irrigation of agricultural crops has generated interest in recent times. Recently various studies have been conducted on the characteristics of industrial wastewaters and their effects on soil properties and agricultural crops[18-21]. But much attention has not been paid so far on the use of distillery wastewater on agronomical practices of black gram (V. mungo). Keeping in view the problem of wastewater disposal, scarcity of irrigation water and reuse of wastewater, their effect on soil quality, accumulation of heavy metals and economic importance of V. mungo, the present investigation was undertaken to study the enrichment and accumulation of heavy metals in soil and Vigna mungo L. (Black gram) after irrigation with distillery wastewater. A field study was conducted in the Experimental Garden of the Department of Zoology and Environmental Sciences, Faculty of Life Sciences, Gurukula Kangri University Haridwar, India (29o55'10.81'' N and 78o96 07'08.12'' E), during the year 2012 and 2013. Six plots (each plot had an area of 9 m²) were selected for six treatments of distillery wastewater viz. 0% (control), 20%, 40%, 60%, 80% and 100% for the cultivation of V. mungo. The experiment was conducted under completely randomized designed and replicated by three times. Shamli Distillery and Chemical Works, Shamli (Uttar Pradesh) was selected for the collection of wastewater samples. The treated wastewaters were collected from outlet of the wastewater treatment plant situated in the campus of the distillery. The wastewater brought to the laboratory and was analyzed for various physico-chemical and microbiological parameters viz., TDS, pH, electrical conductivity (EC), dissolved oxygen (DO), biochemical oxygen demand (BOD), chemical oxygen demand (COD), chlorides (Cl-), sodium (Na+), potassium (K+), calcium(Ca2+), magnesium (Mg2+), total Kjeldahl nitrogen (TKN), phosphate (PO43-), iron (Fe), cadmium (Cd), chromium (Cr), copper (Cu), manganese (Mn), zinc (Zn), standard plate count (SPC) and most probable number (MPN) following standard methods and further used for irrigation of V. mungo. The seeds of Vigna mungo (var. Pant U-30) were procured from Indian Council of Agriculture Research (ICAR), Pusa, New Delhi and sterilized with 0.01% mercuric chloride and was soaked for 12 hours. Seeds were sown in 10 rows with a distance of 30.0cm between rows, while distance between the seeds was 15cm. The thinning was done manually after 15 days of germination to maintain the desired plant spacing and to avoid competition between plants. Plants in each plot were fertigated twice in a month with 50 gallons of distillery wastewater with 20%, 40%, 60%, 80% and 100% treatments along with bore well water as the control. The soil was analyzed before sowing and after harvesting of crop for various physico-chemical parameters viz. bulk density (BD), water holding capacity (WHC), soil texture, EC, pH , Cl-, OC, Na+, K+, Ca2+, Mg2+, Fe2+, TKN, PO43-, SO42-, Cd, Cr, Cu, Mn and Zn following standard methods. For heavy metal extraction 10ml sample of distillery wastewater and 1.0g of air dried soil or plants were taken in digestion tubes separately. In each sample 3ml of concentrate HNO3 was added and digested in an electrically heated block for 1hour at 145oC. To this mixture 4ml of HClO4 was added and heated to 240oC for 1hour. The mixture was cooled and filtered through Whatman # 42 filter paper and aliquot was made to 50ml with double distilled water and used for analysis. Heavy metals were analyzed using an atomic absorption spectrophotometer (AAS) following methods of Chaturvedi and Sankar. The enrichment factor for heavy metals accumulated in distillery wastewater irrigated soil and V. mungo was calculated following Kumar and Chopra. Data were subjected to two-way ANOVA by using SPSS (ver. 12.0, SPSS Inc., Chicago, Ill.). Duncan's multiple range test was also performed to determine the difference was significant or non significant. Mean standard deviation and coefficient of correlation (r-value) of soil and crop parameters with wastewater concentrations were calculated with MS Excel (ver. 2003, Microsoft Redmond Campus, Redmond, WA) and graphs were plotted with Sigma plot (ver. 12.3, Systat Software, Inc., Chicago, IL). The characteristics of distillery wastewater at various concentrations are shown in table 1. The effluent was acidic in nature. The low pH of distillery wastewater might be due to the presence of higher concentration of organic acids such as CH3COOH[24,25]. The wastewater was rich in Na+, K+, Ca2+, Mg2+, Fe2+, TKN, NO32-, PO43- and SO42- and were found beyond the prescribed limit of Indian irrigation standards. The higher values BOD, COD, TKN and PO43- might be due to the presence of high oxidizable organic matter and rapid consumption of dissolved inorganic materials[27-29]. The values of Na+, K+, Mg2+ and SO42- were also found higher in wastewater, which is associated with higher EC of the distillery wastewater[30,31]. The concentration of heavy metals viz. Cd, Cr, Cu, Mn and Zn were also found higher in distillery wastewater than the permissible limit given by bureau of Indian standard (Table 1). Total bacterial count and most probable number showed higher load of microbial species in distillery wastewater and it likely due to higher organic load of distillery wastewater. Table 1: Physico-chemical, heavy metals and microbiological characteristics of distillery wastewater. Mean± SE of six replicates; aBIS- Bureau of Indian standard; b- Not defined in standard; cBDL- Below detection limit. The soil characteristics after irrigation of V. mungo with different concentrations of distillery wastewater are presented in (Table 2). All the concentrations of distillery wastewater showed significant increase in the OC, Na+, K+, Ca2+, Mg2+, Fe2+, TKN, PO43-, SO42-, Cd, Cr, Cu, Mn and Zn of the soil. It might be attributed to higher organic load of distillery wastewater[33-37]. Similarly, earlier studies of soil irrigated with distillery wastewater also showed an increase for these parameters as reported by Kumar and Chopra. The findings were in accordance with Pandey et al. The higher values of EC of distillery wastewater irrigated soil indicated enrichment of soluble cations and anions such as Na+, K+, Ca2+, Mg2+, Fe2+, TKN, PO43-, and SO42- through the use of wastewater in different concentrations. In the present study, there was a maximum increase in the EC (3.78dSm-1) of soil as the concentration of distillery effluent increased up to 100%. This might be due to increase in concentration of potassium salts which are mainly responsible for increasing the EC of the distillery wastewater as also reported by Chandra et al. Table 2: Change in physico-chemical characteristics of soil before and after irrigation of V. mungo with distillery wastewater. The ANOVA showed that 20% to 100% concentrations of distillery wastewater showed significant (P < 0.05/P < 0.01) changes in OC, Na+, K+, Ca2+, Mg2+, Fe2+, TKN, PO43-, SO42-, Zn, Cd, Cu, Cr and Mn of the soil (Table 2). The coefficient of correlation (r-value) on soil characteristics revealed that EC, pH OC, Na+, K+, Ca2+, Mg2+, Fe2+, TKN, PO43-, SO42-, Zn, Cd, Cu, Mn and Cr were observed to be positively correlated with all distillery wastewater concentrations (Table 3). Moreover, the enrichment factor indicated the enrichment of heavy metals in the soil and was found in order of Cd>Cr>Zn>Cu>Mn after irrigation with distillery wastewater (Figure1). Table 3: Coefficient of correlation (r) between distillery wastewater and soil characteristics. 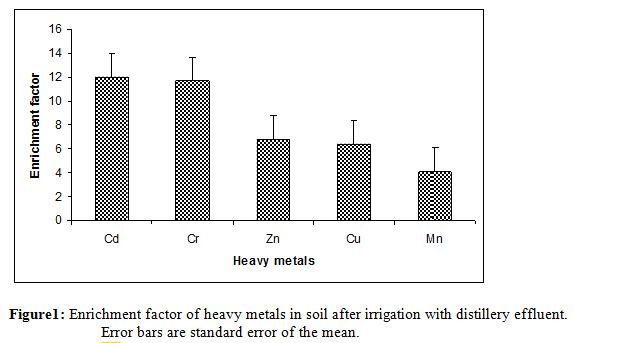 Figure 1: Enrichment factor of heavy metals in soil after irrigation with distillery effluent. Error bars are standard error of the mean. 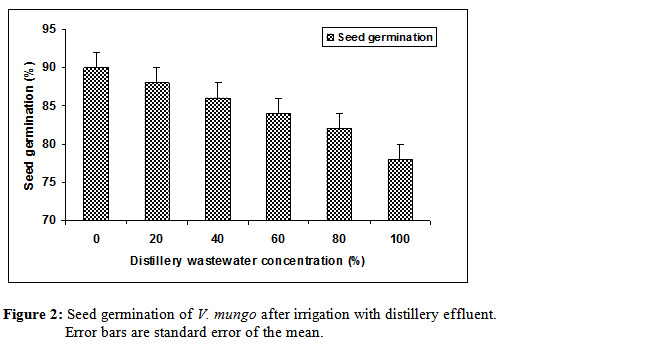 The maximum seed germination (90.00%) of V. mungo was observed with control while the minimum (78.00%) was noted with 100% concentration of distillery wastewater (Figure 2). The seed germination of V. mungo was found to be negatively correlated (r = -0.97) with distillery wastewater. 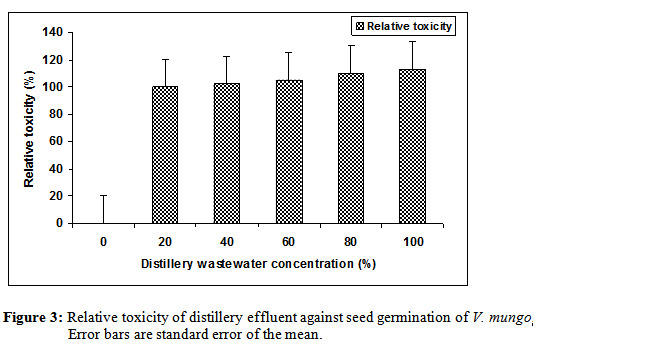 The maximum relative toxicity (RT) against seed germination of V.mungo was recorded with 100% concentration of distillery wastewater (Figure 3). The RT was observed to be positively correlated (r = +0.95) with different concentrations of distillery wastewater. This type of germination pattern of V. mungo is likely due to the presence of toxicants in higher concentration of wastewater, which may inhibit the germination at higher concentrations. In addition, that the availability, uptake and leaching of nutrients is greatly influenced by a number of physico-chemical factors. Among various physico-chemical factors, the pH plays a significant role in the soil. In the acidic soil environment, the availability of the basic cations like Ca2+, Mg2+, K+ and Na+ becomes lower due to leaching. Thus the availability of these nutrients decreases as per increase in the acidic character of the soil. However, it directly affects the germination and growth of the crop plants[39,40]. Figure 2: Seed germination of V. mungo after irrigation with distillery effluent. Error bars are standard error of the mean. Figure 3: Relative toxicity of distillery effluent against seed germination of V.mungo. Error bars are standard error of the mean. At vegetative growth (45days after planting) of V mungo the maximum shoot length, root length, chlorophyll content, LAI and dry weight of V. mungo were noted with 40% concentration of distillery wastewater (Table 4). 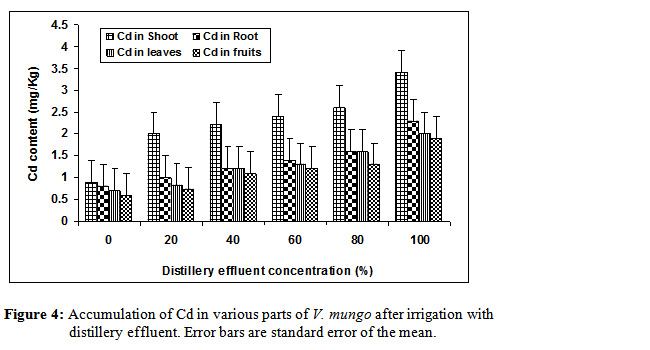 The distillery wastewater irrigation had significant (P < 0.05) effect on shoot length of V. mungo whereas root length, chlorophyll content, LAI and dry weight of V.mungo were noted non-significantly (P > 0.05) affected after distillery wastewater irrigation. At vegetative growth stage the performance of V. mungo was gradually increased from 20% to 40% concentration of distillery wastewater, and decreased when the wastewater concentrations increased from 60% to 100%. The agronomical parameters at vegetative growth stage showed positive correlation with distillery wastewater concentrations (Table 5). These observations were in agreement with earlier reported results by Albino and Murugan. Kumar and Copra also reported that 25% concentration of distillery wastewater was found to be beneficial for the growth of shoot and root in V. radiate (L.) plants as compared to control, indicating the enhancing influence of plant nutrients present in the wastewater. Bharagava et al also found that post distillery wastewater irrigation increases the chlorophyll and protein contents in Indian mustard plants (Brassica nigra L.) at the lower concentrations (25% and 50%) of distillery wastewater followed by a decrease at higher concentrations (75% and 100%) of distillery wastewater as compared to their respective controls. 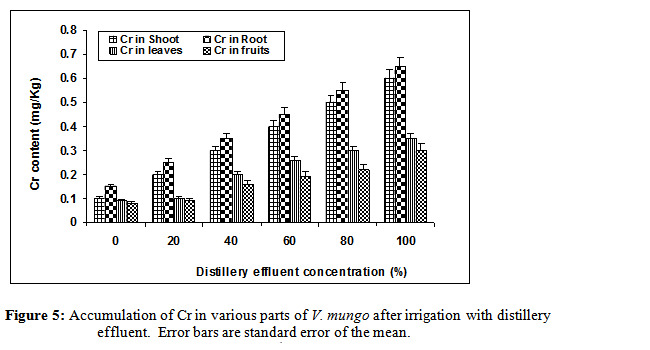 Table 4: Effect of distillery wastewater irrigation on agronomical characteristics of V. mungo. Mean ± SE of six replicates; Significant F -*P > 5% level; ns - non significant; a - significantly different to the control; CD -Critical difference; DAP - Days after planting. At vegetative growth stage, the growth of V. mungo was decreased at higher concentration of distillery wastewater. The higher EC is the indicator of higher salt content in higher concentrations of distillery wastewater. The higher salt content acts as a limiting factor for the seed germination and vegetative growth. Thus, the higher EC has been found to inhibit for the plant growth. These findings suggest a link between EC and plant growth as has earlier been reported by Kumar and Chopra. The chlorophyll content of V. mungo was observed higher with 40% distillery wastewater and it is likely due to presence of significant content of Fe, Mg and Mn in the distillery wastewater, which is associated with the synthesis of chlorophyll in plants. The deficiency of Fe, Mn and Mg in plants causes significant changes in the plant metabolism, and induces chlorosis and necrosis and early leaf fall[26,41,42]. The number of flowers of V. mungo at flowering stage (60days after planting) were affected non-significantly (P > 0.05) after distillery wastewater irrigation (Table 4). The maximum flowers of V. mungo were observed with 40% concentration of distillery wastewater. The number of flowers of V. mungo was decreased when the wastewater concentration increased from 60% to 100% and it was noted positively correlated with distillery wastewater concentrations (Table 5). Nitrogen and phosphorus are essential for flowering. Too much nitrogen can delay or prevent flowering, while phosphorus deficiency is sometimes associated with poor flower production or flower abortion. The maximum flowering of V. mungo was observed with the 40% concentration of distillery wastewater and this might be due to that 40% concentration contains sufficient N and P. Furthermore, P and K prevent flower abortion so pod formation occurs[21,24,26]. Table 5: Coefficient of correlation (r) between distillery wastewater and agronomical characteristics of V. mungo. At maturity stage (90 days after planting) the maximum number of pods/plant, crop yield and harvest index of V. mungo was with 40% concentration of distillery wastewater (Table 4). Crop yield and HI of V. mungo were recorded to be significantly (P < 0.05) affected with distillery wastewater irrigation. Number of pods/plant of V. mungo was noted non-significantly (P > 0.05) different with wastewater irrigation. 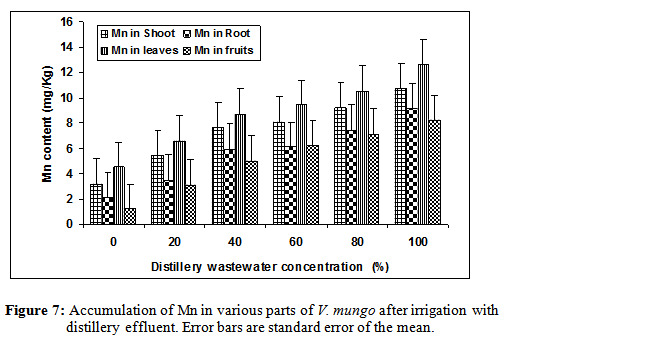 HI of V. mungo was significantly positively correlated with distillery wastewater irrigation (Table 5). The role of K, Fe, Mg and Mn at maturity is important and associated with synthesis of chlorophyll and enhances formation of pods at harvest. The K, Fe, Mg and Mn contents could benefit pod formation and yield of the plant as it does for soybean (Glycine max L.) as reported by Hati et al. The 40% distillery wastewater favoured pod formation and crop yield of V. mungo. This is likely due to the presence of K, Fe, Mg and Mn contents in 20% and 40% distillery wastewater; higher distillery wastewater concentrations lowered pod formation and crop yield of V. mungo. The metals content in various plant parts of V. mungo were increased as per distillery wastewater concentration increased. 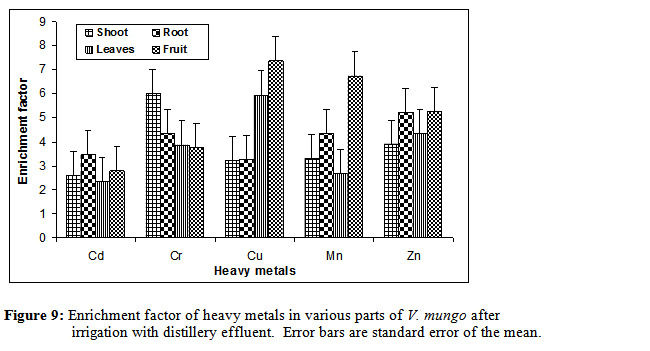 The accumulation of various heavy metals in different parts of V. mungo was in order of leaves>shoot>root> fruits for Cu, Mn and Zn, root>shoot>leaves>fruit for Cd and Cr in V. mungo after distillery wastewater irrigation (Figures 4-8). 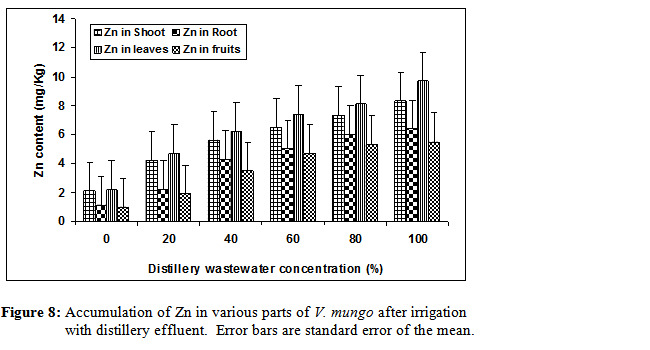 The enrichment factor was recorded in the order of Cu>Zn>Mn>Cr>Cd in V. mungo after irrigation with distillery wastewater (Figure 9). Chandra et al. reported the higher content of metals (Cu, Cd, Cr, Zn, Fe, Ni, Mn, and Pb) in wheat and mustard plants irrigated with mixed distillery and tannery wastewaters. Figure 4: Accumulation of Cd in various parts of V. mungo after irrigation with distillery effluent. Error bars are standard error of the mean. Figure 5: Accumulation of Cr in various parts of V. mungo after irrigation with distillery effluent. Error bars are standard error of the mean. Figure 6: Accumulation of Cu in various parts of V.mungo after irrigation with distillery effluent. Error bars are standard error of the mean. Figure 7: Accumulation of Mn in various parts of V.mungo after irrigation with distillery effluent. Error bars are standard error of the mean. Figure 8: Accumulation of Zn in various parts of V. mungo after irrigation with distillery effluent. Error bars are standard error of the mean. Figure 9: Enrichment factor of heavy metals in various parts of V. mungo after irrigation with distillery effluent. Error bars are standard error of the mean. Figure 10: Content of crude proteins, crude fiber and crude carbohydrates in V. mungo after irrigation with distillery effluent. Error bars are standard error of the mean. This study concluded that distillery wastewater irrigation significantly (P < 0.01) increased the EC, pH, Cl-, OC, Na+, K+, Ca2+, Mg2+, Fe2+, TKN, PO43-, SO42-, Cd, Cr, Cu, Mn and Zn of the soil. The agronomical performance of V. mungo was gradually increased at lower concentration i.e. from 20% to 40% concentration of distillery wastewater and decreased at higher concentrations i.e. 60% to 100% concentration of distillery wastewater. It is likely due to that there are certain growth stimulants and inhabitants are present in distillery wastewater which is responsible for this type of growth performance. The maximum agronomical growth of V. mungo was observed with 40% concentration of distillery wastewater. The enrichment factor of heavy metals was in the order of Cd>Cr>Zn>Cu>Mn for soil and Cu>Mn>Zn>Cr>Cd for V. mungo after irrigation with distillery wastewater. 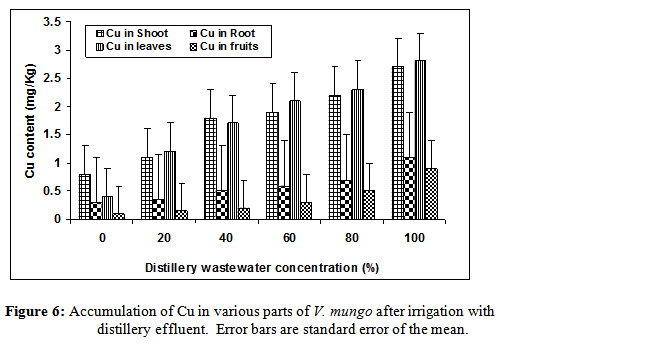 The accumulation of various heavy metals was plant part specific and were found in order of leaves>shoot>root> fruits for Cu, Mn and Zn, root>shoot>leaves>fruit for Cd and Cr in V. mungo after distillery wastewater irrigation. Thus, the wastewater can be used after dilution for maximum yield of V. mungo. Further studies are required on changes in soil and biochemical components of V. mungo after distillery wastewater irrigation. The University Grants Commission, New Delhi, India is acknowledged for providing the financial support in the form of UGC research fellowship to the corresponding author. 1. Baghel, R.S. Toxicity of distillery wastewater on seed germination, seedling growth andmetabolism in Pisum sativum. (2008) Research J Environ Life Sci (1): 29-32. 2. Chandra, R., Bhargava, R.N., Yadav, S. et al. Accumulation and distribution of toxic metals in wheat (Triticum aestivum L.) and Indian mustard (Brassica campestris L.) irrigated with distillery and tannery wastewaters. (2009) J Hazard Mater 162(2-3): 1514-1521. 3. Ayyasamy, P.M., Yasodha, R., Rajakumar, S., et al. Impact of sugar factory effluent on the growth and biochemical characteristics of terrestrial and aquatic plants. (2008) Bull Environ Contam Toxicol 81(5): 449- 454. 4. Baskaran, L., Sankar, G.K., Chidambaram, A.L.A., et al. Amelioration of sugar mill effluent polluted soil and its effect of green gram (Vigna radiata L.). (2009) Botany Research International 2(2): 131-135. 5. Bharagava, R.N., Chandra, R., Rai, V. Phytoextraction of trace elements and physiological changes in Indian mustard plants (Brassica nigra L.) grown in post methanated distillery effluent (PMDE) irrigated soil. (2008) Bioresour Technol 99(17): 8316-8324. 6. Ezhilvannan, D., Sharavanan, P.S., Vijayaragavan, M. Effect of sugar mill effluent on changes of growth and amino acid and protein contents of maize (Zea mays L.) plants. (2011) J Ecobiotechnol 3(7): 26-29. 7. E.J. Ferguson, "Heavy metals in plants. In: The heavy elements, Chemistry, Environmental Impact and Health Effects". Ferguson (Ed) Pergamon Press, Oxford, UK, pp 7-30, 1990. 8. Hati, K.M., Biswas, A.K., Bandyopadhyay, K.K., et al. Soil properties and crop yields on a vertisol in India with application of distillery effluent. (2007) Soil and Tillage Research 92(1-2): 60-68. 9. Rath, P., Pradhan, G., Misra, M.K. Effect of distillery spent wash (DSW) and fertilizer on growth and chlorophyll content of sugarcane (Saccharum officinarum L.) plant. (2011) Recent Research in Science and Technology 3(4): 169-176. 10. Kannan, A., Upreti, R.K. Influence of distillery effluent on germination and growth of mung bean (Vigna radiata, L.R. Wilczek) seeds. (2008) J Hazard Mater 153(1-2): 609-615. 11. Kaushik, A., Kadyan, B.R., Kaushik, C.P. Sugar mill effluent effects on growth, photosynthetic pigments and nutrient uptake in wheat seedlings in aqueous vs. soil medium. (1996) Water Air and Soil Pollution 87: 39–46. 12. Kisku, G.C., Barman, S.C., Bhargava, S.K. Contamination of soil and plants potentially toxic elements irrigated with mixed industrial effluent and impact in the environment. (2000) Water, Air and Soil Pollution 120: 121- 137. 13. Kumar, V., Chopra, A.K. Fertigation effect of distillery effluent on agronomical practices of Trigonella foenum-graecum L. (Fenugreek). (2012) Environ Monit Assess 184(3): 1207-1219. 14. Kumar, V., Chopra, A.K. Response of sweet sorghum after fertigation with sugar mill effluent in two seasons. (2013a) Sugar Tech 15(3): 285-299. 15. Albino, J.W., Murugan, M. Effect of textile mill effluent on growth and germination of black gram - Vigna mungo (L.) Hepper. (2010) Int J Pharma and Bio Sci 1(1): 1-7. 16. Kumar, V., Chopra, A.K. Ferti-irrigational effect of paper mill effluent on agronomical characteristics of Abelmoschus esculentus L. (Okra). (2013b) Pak J Biol Sci 16(22): 1426-1437. 17. Kumar, V., Chopra, A.K. Enrichment and translocation of heavy metals in soil and Vicia faba L. (Faba bean) after fertigation with distillery effluent. (2013c) Int J Agri Policy Research 1(5): 131-141. 18. Distribution, enrichment and accumulation of heavy metals in soil and Trigonella foenum-graecum L. (Fenugreek) after fertigation with paper mill effluent. (2013d) OJMetals 3(2A): 8-20. 19. Nath, K., Singh, D., Sharma, Y.K. Combinatorial effects of distillery and sugar factory effluents in crop plants. (2007) J Environ Biol 28(3): 577-582. 20. Kumar, V., Chopra, A.K. The effects of sugar mill effluent on hybrid cultivar of Faba Bean (Vicia faba L.) and soil properties. (2013e) Int J Biotechnol Research 1(6): 91-102. 21. Kumar, V., Chopra, A.K. Accumulation and translocation of metals in soil and different parts of French bean (Phaseolus vulgaris L.) amended with sewage sludge. (2014) Bull Environ Contam Toxicol 92(1): 103-108. 22. APHA, In: Standard Methods for the Examination of Water and Wastewater. American Public Health Association, 21st edition, Washington, DC. 2005. 23. Chaturvedi, R.K., Sankar, K. Laboratory manual for the physico-chemical analysis of soil, water and plant. Wild life Institute of India, Dehradun, 97, 2006. 24. Kumar, V., Chopra, A.K. Response of high yield variety of Mung bean (Vigna radiata L.) after fertigation with distillery effluent in two seasons. (2013g) Int J Biotechnol Research 1(7): 111-125. 25. Kumar, V., Chopra, A.K. Response of French bean to fertigation with wine from molasses distillery effluent in two seasons. (2014) Int J Veg Sci 20(2): 104-123. 26. Kumar, V., Chopra, A.K. Fertigational impact of sugar mill effluent on agronomical practices of Mung bean (Vigna radiata L.) in two seasons. (2014) Int J Agri Sci Research 3(4): 52-68. 27. Kumar, V., Chopra, A.K. Fertigational effects of sugar mill effluent on agronomical characteristics of high yield cultivar of sugarcane (Saccharum officinarum L.) in two Seasons. (2014) Acta Advances in Agriculture Sciences 2(9): 17-39. 28. Kumar, V., Chopra, A.K. Ferti-irrigation effect of paper mill effluent on agronomical practices of Phaseolus vulgaris (L.) in two different seasons. Communications in Soil Science and Plant Analysis 45(6): 2151–2170. 29. BIS, In: "Indian Standards for drinking water- Specification (BIS 10500:1991)" retrieved on 20th April, 2007 from (http:// www.bis.org.in/), 1991. 30. Kalaiselvi, P., Shenbagavalli, S. Mahimairaja, S. et al. Impact of post biomethanated distillery spent wash on seed germination and seedling growth of dry land crops. Madras Agriculture Journal, 96: 331-334, 2009. 31. Kumar, V., Chopra, A.K., Ferti-irrigational impact of sugar mill effluent on agronomical characteristics of Phaseolus vulgaris (L.) in two seasons. (2014) Environ Monit Assess 186(11): 7877-7892. 32. Kumar, V., Chopra, A.K., Pearl millet (Pennisetum Glaucum L.) response after ferti-Irrigation with sugar mill effluent in two seasons. (2014) Int J Recycl Org Waste Agricult 3(3): 1-13. 33. Krishna Leelavathi, K. Toxicity of sugar factory effluent to germination, vigour index and chlorophyll content of paddy. (2002.) Nature Environmental Pollution and Technology 1(3,cop): 249-253. 34. Maliwal, G.L., Patel, K.P., Patel, K.C., et al. Pollution studies on sugar mill effluent, physico- chemical properties and toxic metals. (2004) Pollution Research 14: 231-238. 35. Shenbagavalli, S., Mahimairaja, S., Kalaiselvi, P. Impact of biomethanated distillery spent wash application on soil and water quality: A field appraisal. (2011) Int J Environ Sci 1: 1-7. 36. Chidankumar, C.S., Chandraju, S., Nagendraswamy, R. Impact of distillery spent wash irrigation on the yields of top vegetables (Creepers). (2009) World Applied Science Journal 6(9,cop): 1270-1273. 37. Ramana, S., Biswas, A.K., Kundu, S., et al. Effect of distillery effluent on seed germination in some vegetable crops. (2002) Bioresour Technol 82(3): 273-275. 38. Pandey, S.N., Nautiyal, B.D., Sharma, C.P. Pollution level in distillery wastewater and its phytotoxic effect on seed germination and early growth of maize and rice. (2008) J Environ Biol 29(2): 267-270. 39. Sharma, R.K., Agrawal, M., Marshall, F. Heavy metal contamination of soil and vegetables in suburban areas of Varanasi, India. (2007) Ecotoxicol Environ Saf 66(2): 258-266. 40. Vijayaragavan, M., Prabhahar, C., Sureshkumar, J. et al. Soil irrigation effect of sugar mill effluent on changes of growth and biochemical contents of Raphanus sativus L. (2011) Current Botany, 2(7): 9-13. 41. Yadav, R.K., Goyal, B., Sharma, R.K. et al. Post irrigation impact of domestic sewage effluent on composition of soils, crops and ground water-A case study. (2002) Environ Int 28(6): 481-486. 42. FAO/WHO (2011) Joint FAO/WHO food standards programme codex committee on contaminants in foods. fifth session, 64-89.